Frankie I do not think it is for a restomod. I think that it is going to be for a 340 hp or a FI SW that you will build into a beautiful car like your 250 hp. It might even be the car that you have mentioned here on the Forum before that you had been trying to buy that was in someones basement or garage. In any event we are glad that there is possibly going to be another SW brought back to life. As far as the 63 only hood there was one listed here on the Forum by a member that is located in New Jersey. The price was $3,500.00. It was about a year ago. Good luck and I hope that you find one. They are very hard to come by. If you read Frankie's posts, he did drop a few hints that he was considering selling the '61.. I'm sure the car will be loved.. 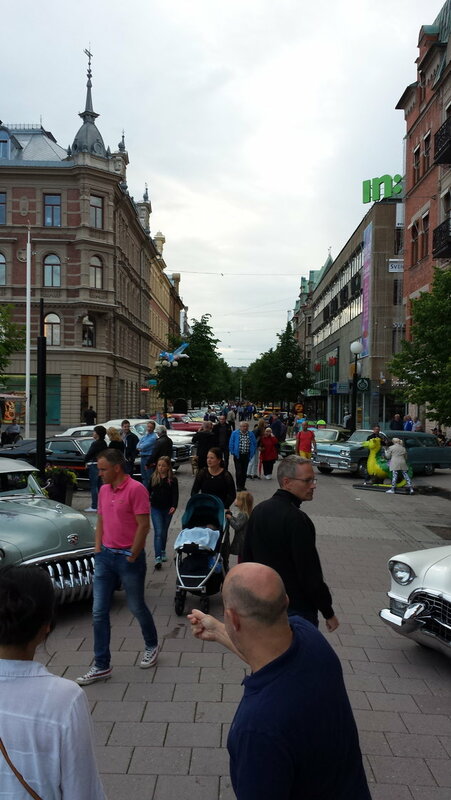 When I was in Sweden last summer, I happened across a car show.. and it was 90% American classics. I never noticed the extra metalic in the paint before Frankie. Purists would probably disapprove but it makes it pop. Was the dash done like that too.....looks it in the pics. So you'll be selling your extra 2x4 setup as well as other stuff? Frank: I got quite a bit of good advice from you when I had questions about my '57 and '61. Your answers and pictures were very helpful. You stated that you were 65 and felt the need to downsize. That got me to thinking. I am 75 and still have three Corvettes, '57,'61 and '86. I have owned them for over 20 years. In addition I am fighting cancer. My oncologist is optimistic about my recovery but perhaps I need to think about downsizing also. Keep on the C1-C2 forum. Your expertise is valuable. Last edited by abdo; 07-23-2016 at 12:52 PM. My sale wasn't any impending situation; more of a feeling that the market had peaked on the first generation Corvettes and that one car will do me just fine for a while. I actually have only had two classics for the last 4 years. Did you advertise in european market or did buyer see it in a USA sales posting? I'd like to broaden the market I'm advertising into. Looking for suggestions. Again, it was a consignment sale so those folks advertise broadly including overseas; however as you know I live in the Orlando tourist area. So the buyer from Germany was here on vacation and wandered into the consignment shop's showroom and just loved the car but was a hardball negotiator so I dropped the price $2K twice and then he was won over. I got top dollar for the car IMO even with the consignment overhead. Initially the shop had the car priced WAY over the top so there was no activity on it until they got more realistic and then three interested parties got involved. The Just Toys consignment shop don't just take anything in for sale. They test drove the car with me, had their mechanic go over it, and, put it on a lift and went through everything. They lightly detailed the car monthly and started it weekly and took good care of it IMO. And I've sold loads of parts here on the forum but for a variety of reasons I went another route to sell the car. The car will be sold with the 'real deal' 270hp carbs; my clones were sold to forum member Bill Pilon about two years ago and so they are gone -- with Bill putting 1,000s of miles on them. The dash was gloss black (also not NCRS correct) as to other original parts the buyer has "first right of refusal" on them at separate pricing. The BW aluminum T-10, original shifter, Wonderbar radio, dual point distributor, etc.. are not in the car but available to him. The hardtop DID go with the car. Last edited by Frankie the Fink; 07-23-2016 at 01:29 PM. Another positive point is, even though the car left the U.S, it will certainly be pampered in Germany/Europe. And what great countryside to enjoy a classic Corvette! Frankie's '61 will be around for a long, long time to come. Just wondering why you decided not to even advertise it for sale here on the Forum? It sounds like there are a couple of long term solid citizen members who would have been interested....... Your car/ your choice, but imho coulda/ woulda/shoulda kept it in the USA! Haven't seen anything about the red SWC or any photos of it for several weeks now. Just talk of a 63 project and a want ad for front end body parts. I wonder if the mostly original SWC with all the owner added options IS the highly classified "project"? So I'll channel some Jason Chaffetz here. Yes or No. Was there a mishap involving the CF's favorite SWC and poster? Your many CF friends are on pins and needles and seem hesitant to ask. Stealth SWC projects ? Unannounced sale of the '61 ? Alien autopsies ? Bigfoot sightings and now a mishap ? Did something happen to Vettebuyer's split window ? That's my favorite SWC and poster ?? Last edited by Frankie the Fink; 07-24-2016 at 08:07 AM. Naw, that's ok Frank - I saw your response to me before you deleted it! As I said in my deleted response I had a few things going on family-wise the last several months (all of that is coming together now) that consumed my time. Rather than selling the '61 myself which I've always done with my other cars (most recently the '67 Chevelle 3 years ago); I looked at other options. The consignment avoided having to store the car, advertise it, negotiate price, screw around with tire kickers and arranging personal inspections, get involved in shipping and answering lots of questions and perhaps dealing with an owner unhappy after the sale (even though I always sell "as-is, where-is). The consignment process was effortless and required no attention from me. I've sold and bought plenty of parts on the forum and it is a nice venue if you want to handle things yourself. Last edited by Frankie the Fink; 07-24-2016 at 08:13 AM. I have a mental image of the lucky new owner in 5th gear/overdrive with the dual quads gulping fuel doing 120mph on the AutoBahn. You haven't really lived unless you ahve listened to the sound of a SB motor and off road exhaust running 6000 RPM at 120MPH with the top off for several miles. Montana didn't used to have a speed limit on the Interstate. I was able do do just that. Glad you found good home for it. Selling a car you have lot of years invested in, can be, well, sort of depressing, but once it has been picked up and the truck is gone, you quickly move on. Art, your still a young pup. After the cancer is behind you, you just drive the 57-61 and 86 like a teenager that just stole them, out for a joy ride trying to impress his girl in the passenger seat. Besides, Franks 65 years are like dog years against your 75 years. I am sure you can out wrench, out run, out think and out drink him any day! Originally Posted by Randy G.
I might be interested in that "fancy, dancy cupholder. I'm tired of trying to stick a Big Gulp in my left shirt pocket. I should ask a dumb question..."Will it fit a '62?" The cup holder is for sale now in the parts section. Let me know if you really want it. If not, another forum member does. I'm going out to the garage to check now.